Keith and Dante are dancing again. This time, Keith and Dante plan to trip the light fantastic, though you’ll see how well that goes, and if that works out better than Keith’s encounter with Dante’s family. Finally, one of Dante’s regular clients brings a startling patient into the clinic. “It’s all a prelude to the horizontal tango,” Dante tells Keith, and drags him to the dance club, two left feet or no. Work has a way of chasing this doctor and vet couple down — the victims of a car crash need their help more than they need a night out. But a night in, tending an injured dog, can be filled with landmines… and music. Includes bonus stories On Call: Family and On Call: Wildlife. Now available at All Romance eBooks as PDF, EPUB, and MOBI, and Amazon. 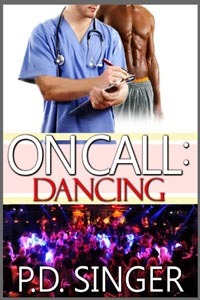 This entry was posted in On Call, Writing and tagged amazon, new release, On Call, self pub. Bookmark the permalink.